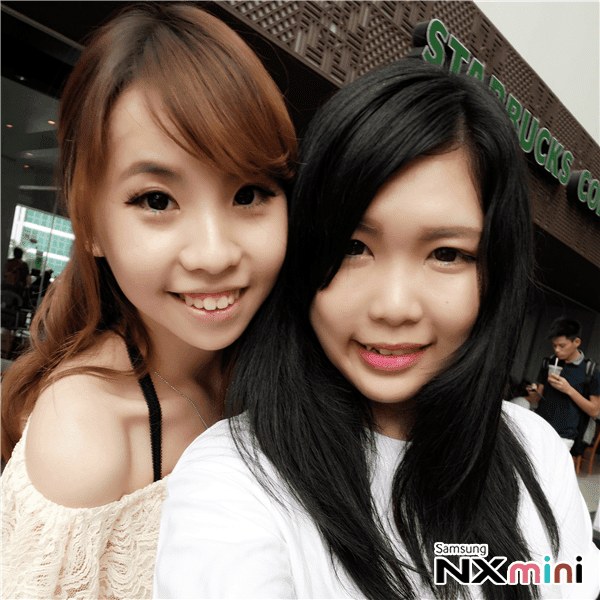 As promised, in this post would like to into more specific review about Samsung NX Mini Smart Camera with NX-M 9mm F3.5 ED Lens. 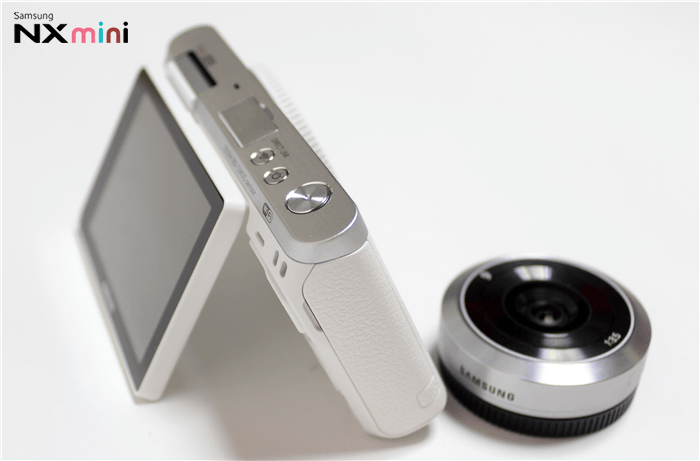 A basic Samsung NX Mini Smart Camera comes with a camera with a basic 9mm kit lens. Then inside the box has rechargeable battery, micro sd card (mine is 16GB), hand-strap, charger and usb cable, guidebooks, software CD-ROM and Adobe Photohop Lightroom 5 DVD-ROM. 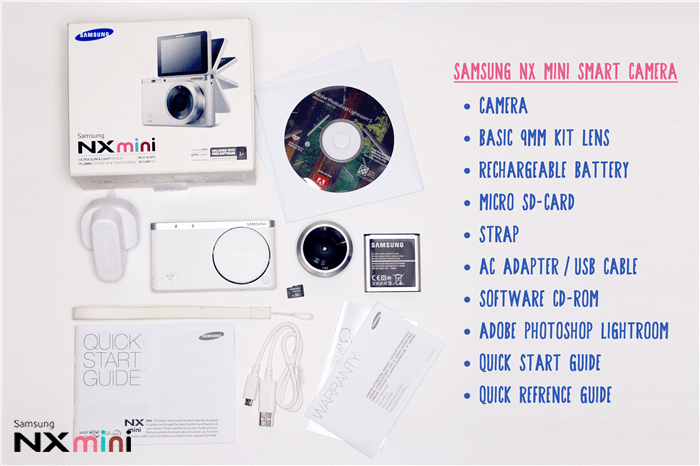 The price of a Samsung NX Mini Smart Camera is MYR 1399. 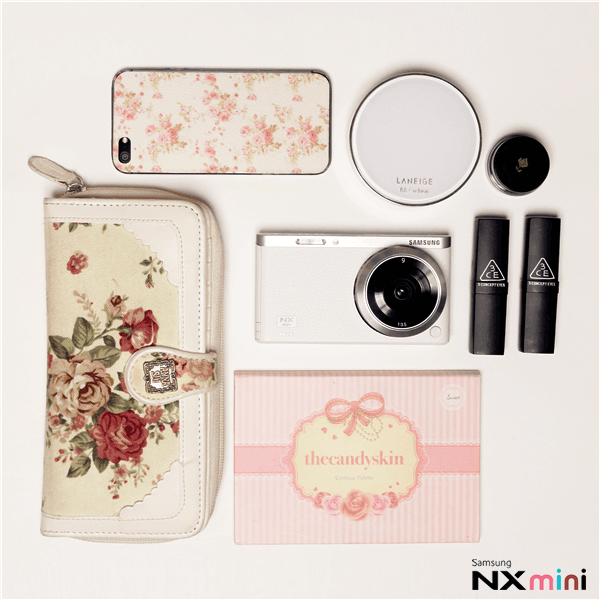 With a solid premium magnesium body bound by natural leather-like material, the NX Mini is exquisitely modern with just the perfect touch of analogue. It's simply elegant and pocket-friendly. 20.5 Mega Pixels with 1" (13.2 x 8.8 mm) -type BSI CMOS sensor. 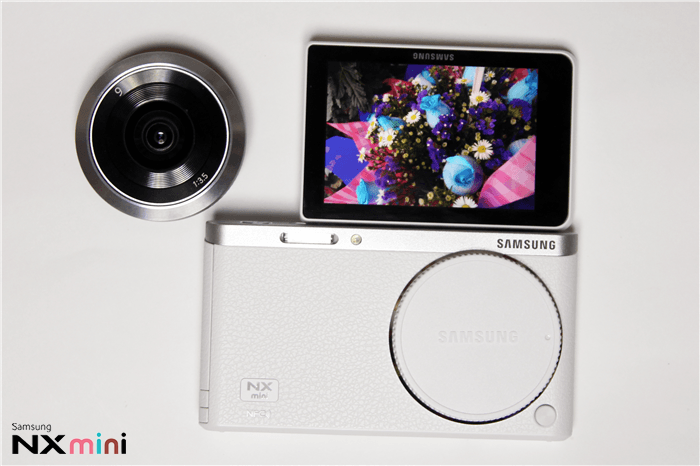 Samsung NX mini delivers high resolution, letting capture more of world so can relive precise details of every moment with vivid, true-to-life colors. 3-inch tilting touchscreen TFT LCD display with a 320x480 HVGA resolution and 460.8K dots. The tilting screen also lets you more easily snap shots at lower angles. 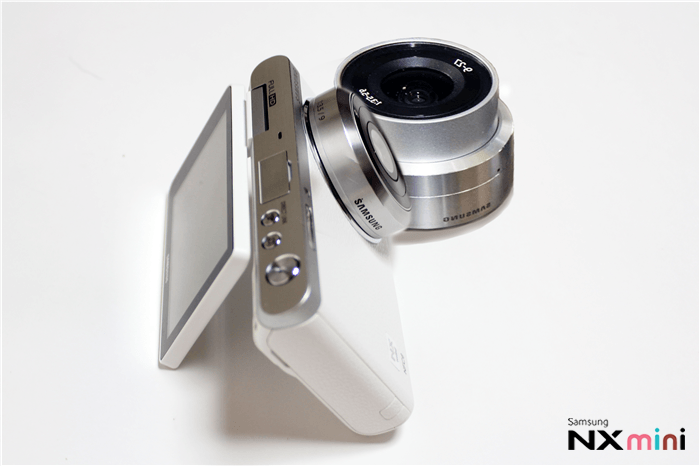 The flip-up design lets you rotate the screen a full 180-degrees making the NX Mini the ideal "selfie" camera for those moments when a low-res, low-ISO smartphone camera just won't cut it. 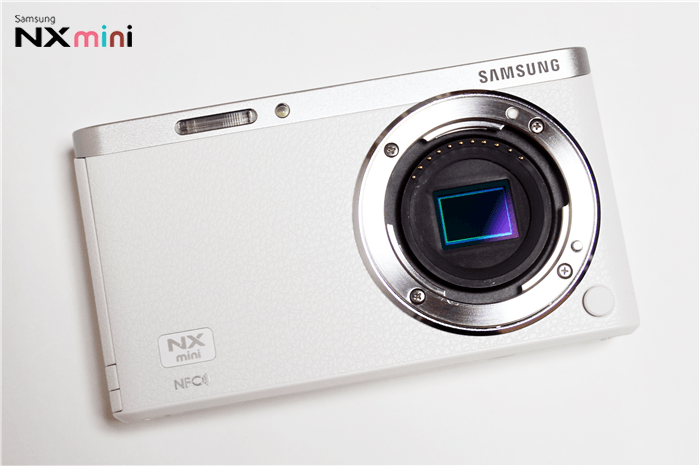 Samsung NX Mini has the title of 'world's slimmest interchangeable lens camera'. The portability and versatility that's easy for people carry-to-go-anywhere yet offers creative flexibility of interchangeable lenses. 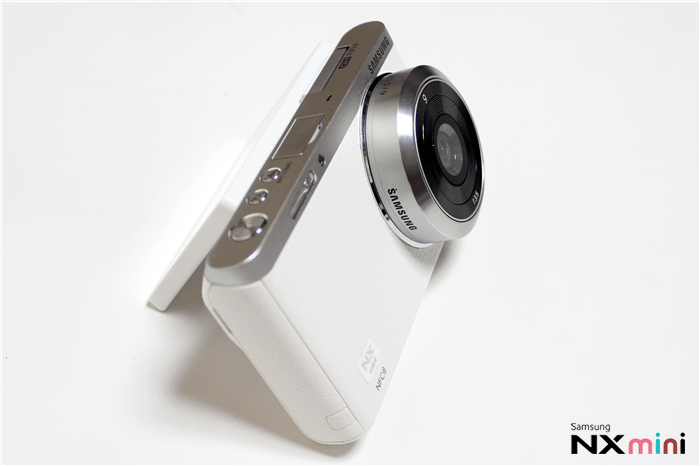 Samsung NX Mini has built-up WIFI and NFC technology for easy pairing and sharing with smartphones and tablets. Once paired, users can shoot and share photos to a variety of social networks. 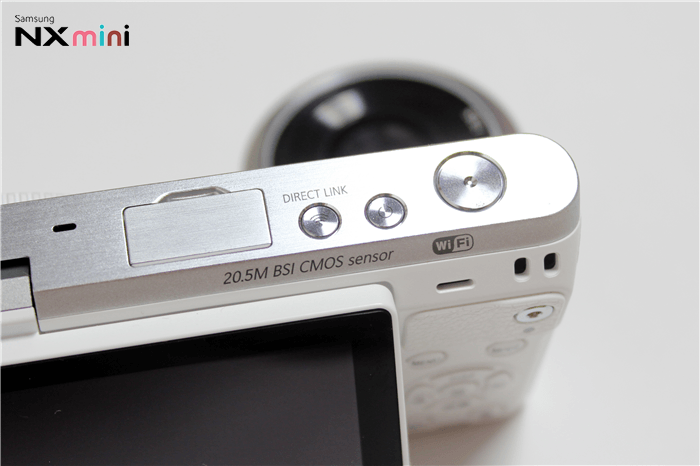 Not freshly things anymore, Samsung NX Mini does had remotely control system via by smart device. 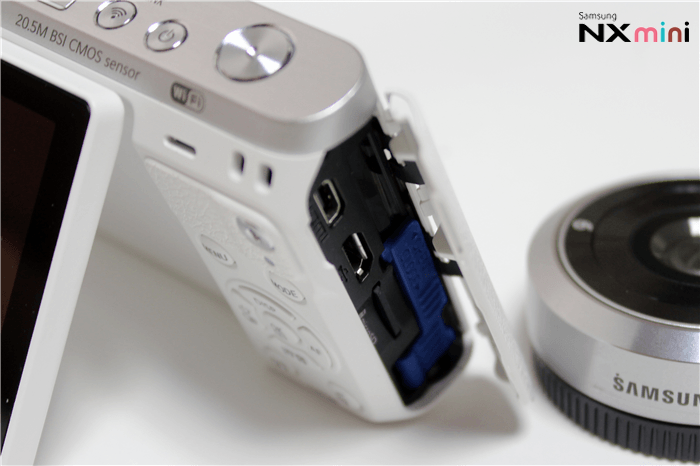 Samsung NX Mini uses MicroSD memory cards, including HC, XC and UHS-I variants. Besides that, it uses rechargeable lithium ion battery has a 2330mAh capaity that's CIPA-rated for 650 shots with 9mm lens or 530 shots with the 9-27mm lens. The battery is charged in-camera, and an AC adapter and USB cable are provided in the bundle. Samsung NX-M 9mm F.35 ED pancake lens is an pretty wide-angle with only 13mm thick (equivalent to a 24.3mm lens on a 35mm camera). It doesn't contains OIS and not zoom-able. 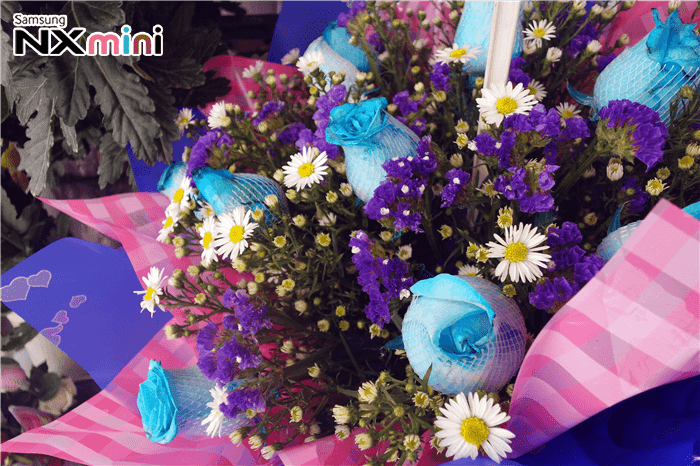 It in a set with the kit of Samsung NX Mini Smart Camera. 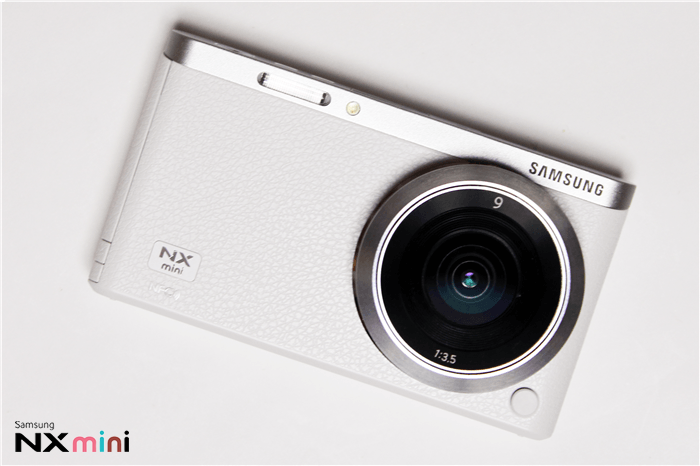 Samsung NX Mini offers external lens-attach as well which is NX-M 9-27mm f/3.5 - 5.6 OIS Zoom Lens with optical image stabilization (24.3 - 72.9mm equivalents), and a fast portrait prime 17mm f/1.8 O.I.S. (45.9mm equivalent). 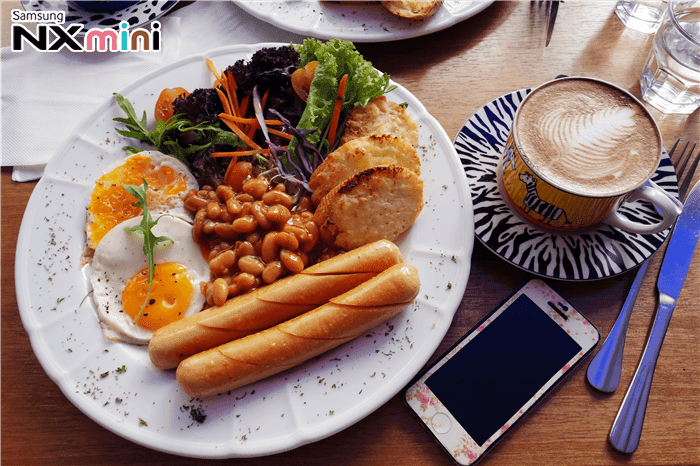 Here's some pictures that capture in different mode with Samsung NX-M 9mm F3.5 ED Wide Angle Pancake Lens. I love the wide angle gives an optimum angle for shooting landscapes and self-portraits easily. Major love! 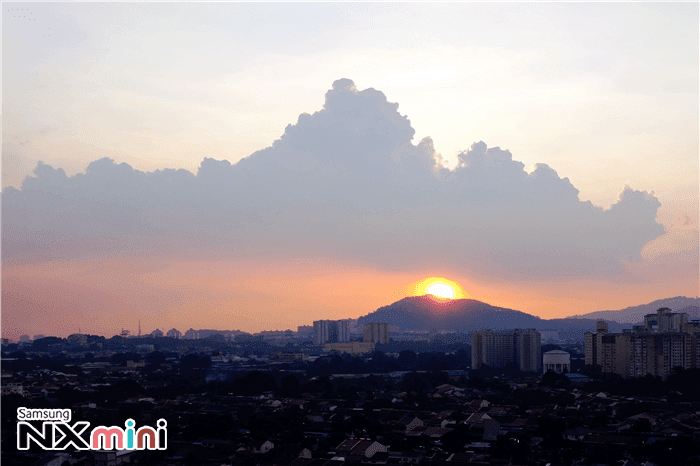 Sunset landscape captured with 'Smart - Landscape' mode. Foodporn using natural sunlight captured with 'Smart - Food' Mode. Abstract flowers captured with 'Smart - Macro' Mode. 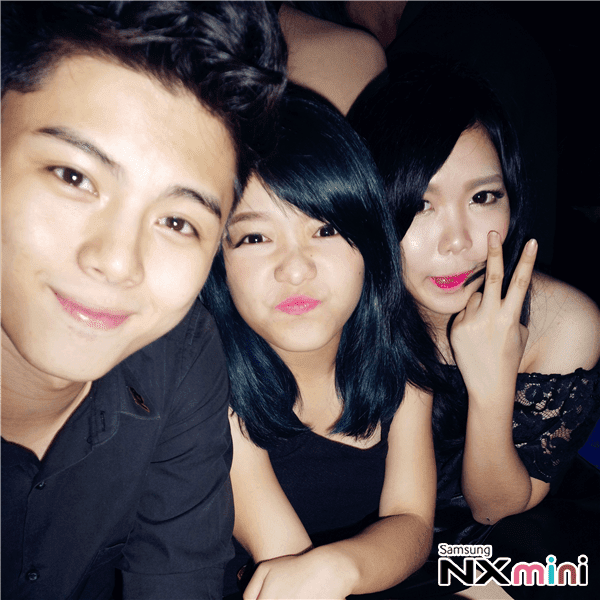 Outdoor selfie under natural sunlight captured with 'Smart - Beauty Face' Mode with 'Wink-shot' Function'. 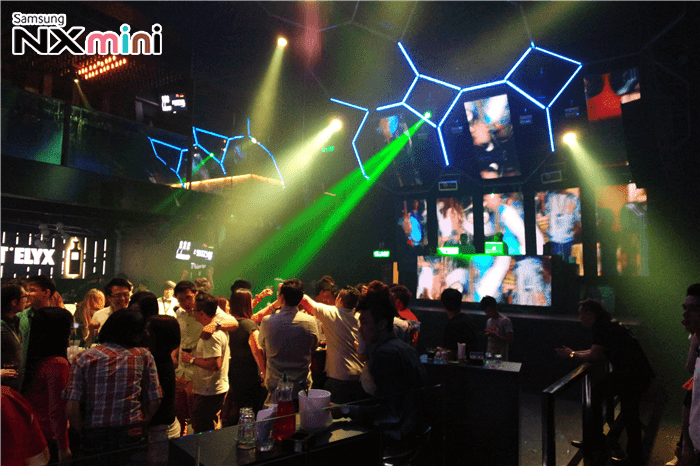 Nightlife Indoor picture captured with 'Aperture Priority' Mode. Night-Indoor Selfie captured with 'Auto' Mode with Flash. 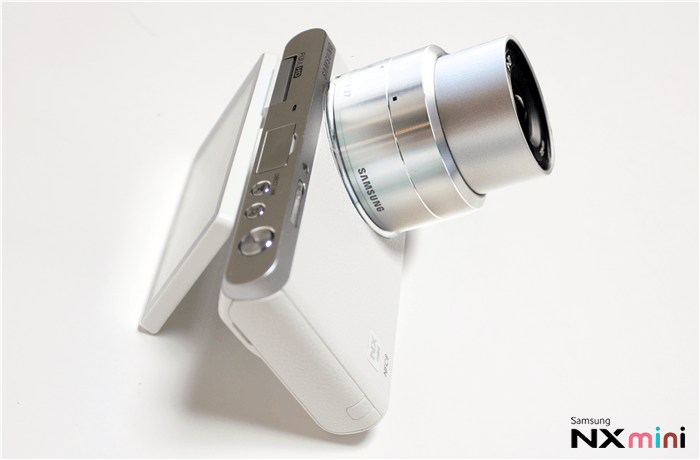 Samsung NX-M 9mm F3.5 ED Wide Angle Pancake Lens is really easy to use although it doesn't have zoom function. So far, I love the quality and color payout by using this lens. As for another model of lens, Samsung NX-M 9-27mm F.35-5.6 ED OIS Lens (external) which only available on 1st June 2014. Thanks my brother helps me to get it but I still have proper time review the lens yet. Will try to show you guys in future post. That's all for right now.